The office for a strength and conditioning coach is not your typical white-walled workspace. Quinnipiac assistant strength and conditioning coach Emily Webster is more at home in a weight room anyway. One step inside her ‘office’ and firm, but soft composite flooring greets four sturdy squat racks lined before the mirrored wall. Numerous weights, chains and rubber bands adorn the frames, while the relentless clank of metal hitting the floor, accompanied by music booming throughout, completes the beautiful chaos. For Webster, this is a place of sanctuary for Quinnipiac’s Division I athletes to get better. Webster turns on the lights of the weight room at 5:30 a.m. Monday through Friday for the first team session at 6 a.m. Those same lights don’t go off until 6 p.m.. 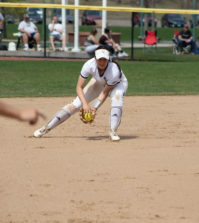 Her day consists of a constant flow of Quinnipiac athletes coming in and out, one team and one hour-session at a time. Even though it’s a daily grind, Webster doesn’t blink an eye about getting up at the crack of dawn and staying late. Quinnipiac has 21 Division I teams in all and they compete under the bright lights for the students and fans during the season. Behind the scenes, there is the constant effort of the strength and conditioning coaches to put every team’s athletes in the best position to compete at the Division I level. Webster chiefly works with the women’s rugby, volleyball, field hockey and soccer teams in the fall and the men’s and women’s lacrosse teams in the spring. According to Webster, in-season teams usually have strength and conditioning sessions once or twice a week based on their game schedule, while offseason teams can put in as many as five sessions a week with Webster and her staff. Contrary to the popular belief that strength and conditioning is all about getting stronger in a weight room, it is just as much a place where mental toughness is hard earned amongst the athletes. That’s why Quinnipiac strength and conditioning has an intrinsic set of rules that the athletes follow unwaveringly. Gaining a mental edge on opponents before the game even starts, begins in the weight room and in practice is where the stand tall rule reigns. Webster first realized her dream of being a strength and conditioning coach as an undergraduate kinesiology student at UConn. UConn was where Webster first experienced a collegiate-level weight room staffed by professionals. In that environment, Webster discovered her love of coaching, working as a graduate assistant eventually. 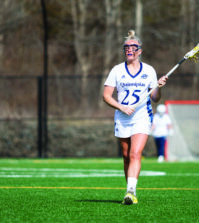 After receiving her Master’s degree in exercise science from UConn in 2014, Webster came straight to Quinnipiac. Patel hired her full time to work with teams on the Mt. Carmel Campus, while he operates from the gym at the TD Bank Sports Center. 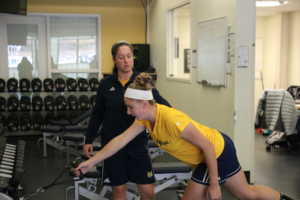 The position at Quinnipiac provides Webster a unique opportunity to build her own strength and conditioning program from the ground up. 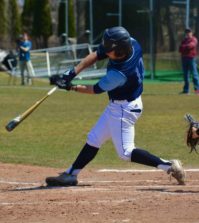 “I came into a situation where [Quinnipiac] didn’t have a full-time strength and conditioning department on the Mt. Carmel Campus,” Webster said. Patel and Webster’s programs may be separated by campus, but they are connected through the same values and standards. Thanks to Patel, Webster has the autonomy to implement what she thinks is right for her athletes. 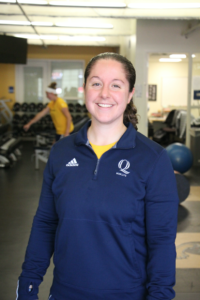 When Webster first started at Quinnipiac she actually worked out of a small corner office in the multi-cultural department in the upper level of the recreation center and would fit all the team training sessions in the once-shared fitness center. Two years after Webster’s start, a varsity weight room was constructed and that has given the opportunity to Webster take the program to another level. The weight room is a platform which has allowed Webster to transform the strength and conditioning to a space that is seriously committed to sharpening Quinnipiac’s athlete’s physically and mentally. One of the ideologies Webster and her staff have implemented for their athletes is called ‘Postural Restoration Institute’ (P.R.I). The key to this training is an emphasis on body posture and what’s called “a neutral position” for the athlete. According to Webster, P.R.I. is more important than ever with this generation of athletes. Student-athletes are not perfect human beings, they have stresses too. Webster has made a point of her weight room mentality. On the contrary, Webster plays devil’s advocate with stress. In the risk-versus-reward sense, some stress on an athlete’s body is a key to resiliency and growing stronger according to Webster. Webster’s support of the athletes reaches further than inside the walls of the weight room. One can usually see her on the sideline behind the bench, watching games that her teams compete in. It’s that level of support and dedication that goes above and beyond which helps Webster have a meaningful impact on the athletes at Quinnipiac.